The textile industry consume large amounts of water and chemicals for dyeing and finishing processes. Due to the variety of organic and inorganic compounds both the dyeing as well as used in other operations, influences the resulting wastewater's characteristics. Colored wastewaters which discharged to recipient waters, reduces the light transmission in water medium, and thus adversely affect the photosynthetic activity. Also accumulation of dyes in some aquatic organisms, increases the risk of toxic and carcinogenic products occurrence. In this context, color removal processes of the textile industry wastewaters which containing dyes have ecologically importance. Chemical purificationmethods for the textile wastewaters, has been the most soughtafter method for many years. Because, the changes which needs to be made in the quality of wastewater, can be easily adjusted with the chemical type and dose. Chemical methods such as chemical precipitation, oxidation and flocculation have been used for the textile waste water treatment, but fragmentation of dye molecules by the reduction have not been studied. Also there are many oxidizing agent has to work on. In this study, chemically color removal of textile wastewater which obtained from a cotton dyeing plant were studied with a strong oxidizing agent and a strong reducing agent. Sodium hydrosulfite was used as strong reducing agent and sodium perchlorate monohydrate was used as strong oxidizing agent. After adding 1,3,5 g/L of chemicals, color removal values were determined with Hach DR 5000 spectrophotometer according to Pt-Co unit. Also organic material removal potentials were determined with GC-MS headspace analysis. Results shows that sodium hydrosulfite has a good potential for both color and organic material removal from textile wastewater.
. Lin, Sheng H., and Ming L. Chen. "Purification of textile wastewater effluents by a combined Fenton process and ion exchange." Desalination 109.2 (1997): 121-130.
. Slokar, Y. March, and A. Majcen Le Marechal. "Methods of decoloration of textile wastewaters." Dyes and pigments 37.4 (1998): 335-356.
. Kang, Shyh-Fang, Chih-Hsaing Liao, and Mon-Chun Chen. "Pre-oxidation and coagulation of textile wastewater by the Fenton process." Chemosphere 46.6 (2002): 923-928.
. Ghoreishi, S. M., and R. Haghighi. "Chemical catalytic reaction and biological oxidation for treatment of non-biodegradable textile effluent." Chemical engineering journal 95.1 (2003): 163-169.
. Brazil Maljaei, Ata, Mokhtar Arami, and Niyaz Mohammad Mahmoodi. "Decolorization and aromatic ring degradation of colored textile wastewater using indirect electrochemical oxidation method." Desalination 249.3 (2009): 1074-1078.
. Trumpolt, Clayton W., et al. "Perchlorate: sources, uses, and occurrences in the environment." (2005). ISNAD Karaboyacı, Mustafa , Uysal, Mesut , Şencan, Aziz , Kılıç, Mehmet . "Chemically Color Removal from Textile Wastewater with Oxidizing and Reducing Agents". 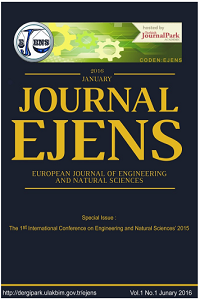 European Journal of Engineering and Natural Sciences 2 / 1 (February 2017): 217-221.